The Makeup Chair is a monthly column by Jillian Wilkey, a professional makeup artist in the Bay Area. This month, I interview Sheryle Pettet, a hairstylist at Salon on the Square, and a new contributor to The Penny Rose. In honor of Sheryle's upcoming first blog in August, I ask her to spill open her makeup bag. Originally from Texas, Sheryle has a California-cool style: she's always wearing jeans, a smile, and rockin' her curly hair. In her off time, you'll find her on the beach with her husband sipping cocktails and lusting after an "anti-aging martini." I wash my face morning and night. My favorite skin products are by ISUN. I cleanse with Phyto-Clease II, which is hydrating with lavender and sage for combination to oily skin. I moisturize with Ultra Restore at night and Sapphire oil during the day. The products are amazing. My makeup is very simple. 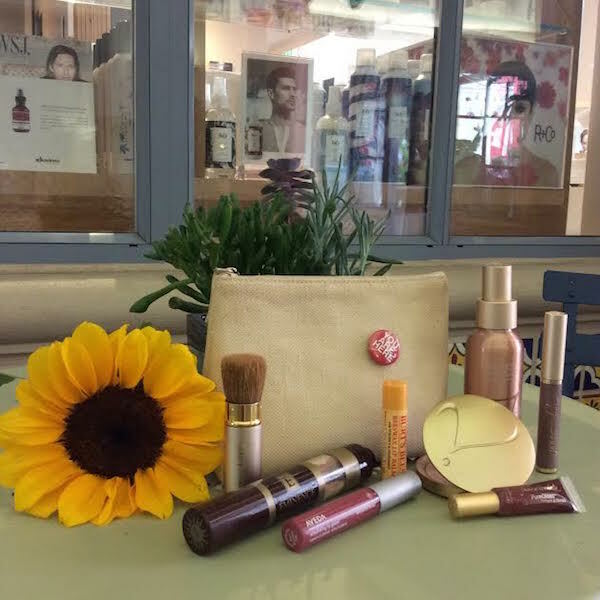 I wear Jane Iredale pressed mineral powder every day. I have oily skin and mineral makeup has been the absolute best thing invented. It has an SPF of 20, which I love. I always have Eminence mineral powder sunscreen with me. The more SPF the better. I always use a hydration mist to set my powder throughout the day. A mid-day spritz helps revitalize my makeup and cool me off. I recently discovered brow gel and it's the bomb. I have tubes of lip balm and lip gloss everywhere. A few favorites are Jane Iredale PureGloss in mulberry, Aveda Lip Glaze in morning rose, and Burt's Bees lip balm.